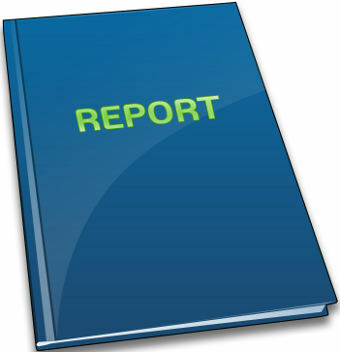 / Regulatory Affairs / ANDAs / FDA-Required Reports Hit the Web – What Does the Data Show? 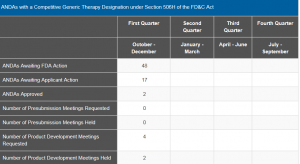 The charts can be found below, but, to summarize, in the first quarter of FY 2019, for priority reviews, there were twenty-seven ANDAs awaiting Agency action, nine awaiting applicant action, and three approvals under this program. There was significantly more action on the CTD ANDAs but only two approvals. The other two charts had no activity reported. 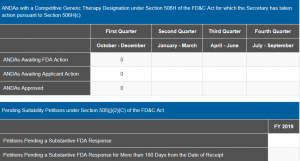 The big surprise is that there was even a blank chart for ANDA suitability petitions as there has been little, if any, FDA action on these petitions (which are supposed to be acted on within ninety days by law) since 2016, making the petition program a bit of an orphan. The programs that everyone thought would be a big boon and speed generic applications to market for certain products appears to be somewhat less utilized than we all may have thought. Here are the charts as provided by the FDA. All well and good, but I still scratch my head at what the numbers really mean and how they inform on past activity.